You need a structure behind your MIP which is not structural by design. Jack, that is exactly what i need! How do you find these parts? Do you have a cnc? Just MDF 3/4 inch, aluminum corners, and bolts and nuts through. No fancy tooling. 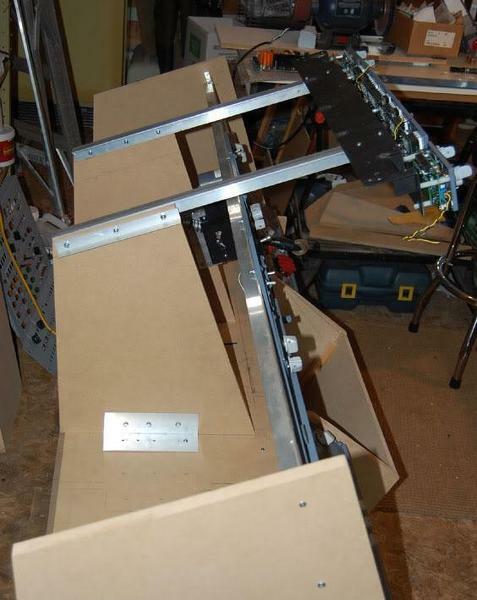 MDF boards will not hold direct bolting you have to use aluminum backers on both sides to make it perfectly sturdy. Thanks, right now i am building the same solution as your laat pic. I dont like the sawing part with angles, hard to get correct. I also hope that sn OEM gear lever can fit once i find any. Managed to remove the paperholders from the back of the seats. Forward window frame completed.hope it will handle the OEM weight of the overhead. Nextup: mounting empty overhead frames. I might think the horizontol beam might be to small but since the other two beams are resting direct on the poles i think this should be fine. Well I'm not too comfortable with this. A major setback, but safety first, redo the overhead structure with metal. Wood beams are no OEM material, especially flimsy ones. NGer is right, use aluminum. It comes in all sizes and profiles , it is light, strong and does not bend! Here is a thought: How much did you pay for your MCP, MIP, Throttle Assy and Pedestal? Now, figure out 25% of that cost and use that amount on paying for the structure that holds it all. In other words, if you spent $10,000 you should at least spend another $1,000 on the structure, and in your pics it looks like you're only spending 1% on it. Please don't take me wrong, I know you're not a builder of sorts, but rethink your structure a little bit or have a friend who knows wood or metal materials help you. Then, spend a little bit more on those materials, and have that friend build it out for you. Believe me, you would not want all the other items destroyed by the Overhead falling and your head will not help stop it from breaking things; although, it will break your heart and make you cry from pain...not physical pain, but mental pain from not building the structure much stronger beforehand...lol! Thanks for the input. I will replace the rear end horizontal stud. But the other beams are used in house construction and i can hang in the backframe (85kg) now without any problem. I copied Robert Archers design. Which parts do you think look weak? I will give that area some focus. This is what i was aiming on. Know Rob only uses OEM aswell. 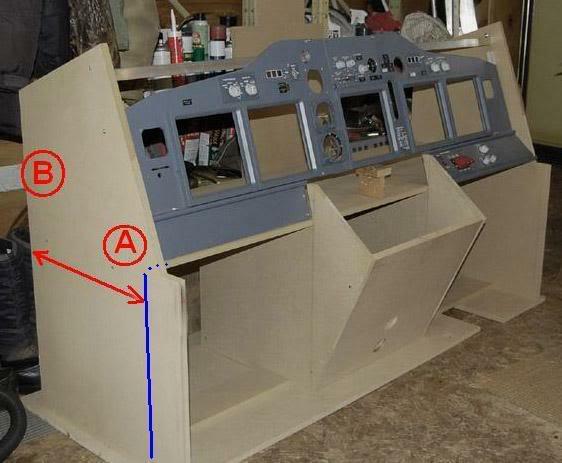 Let me ask you this, if you touch any piece of wood in the setup and wiggle it, does everything else wiggle/move? Now, stand up at the back and grab either vertical stud then shake it side-to-side, does everything else move? If yes to either test, then your structure is not sturdy enough. If you really wish to stick with this setup, change the vertical 2"x4" boards to 4"x4" posts, then have two 2"x4" boards attached on each side of the post going down to your top window board. Make the top window board as two 2"x4" boards attached to each other and do the same for your vertical center window post. Then, if you sim will not move attach a set of 2"x4"'s to the ceiling of the room and from there attach four 2"x4"s down to each corner where the forward overhead will be attached. Thus, the room is now helping to hold the hanging weight of the overhead, as well as helping provide structural stability. I will implement your changes right away! Will add the posts to the windows boards (reeeealy good idea as this is what i considered a weak point!) as you suggests and also add a heavier horizontal post in the back. I am thinking of trying to add a metal structure as my window middle post at the front, this is the only point/thing now that moves a little bit if i hang in the two posts that will support the overhead frame. Do you know what they are called? metal posts that is predrilled and that i can bend to certain angles? Might be a bit expensive, but you could CNC the metal structure? Thanks jack, my structure is completely disassembled right now setback, but my new version will be much better. I am not sure, but could it be stop sign post or something similar? Could you draw out a plan of what you have in mind? Also, I had another idea for you, how about using round wooden dowels to go across from one double board to the next double board? In other words, these dowels would be up behind your overhead and you drill holes for the dowels to fit on each side. Then, place a screw downward through the top of the double board into the ends of the dowels. Think link a baby's crib side rail placed above with the dowels going across from right to left. This in effect would look like a step ladder of sorts. Why do this? Well, it would add strength and reduce any side to side movement above the overhead area, and it would be less weight by using dowels. Foo fighters concert tonight but i wont do anymore building without a plan. I will sketch it up and then post in this thread. I can send you a PM once the sketch is complete. 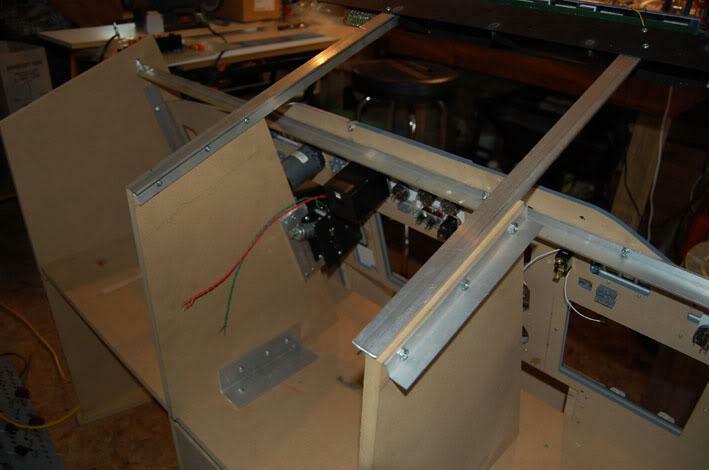 What i can say is that the new plan is to have a sturdy beam in the front across the MIP that the mcp is attached to and i can then attach the window post to it. I feel comfortable to sit on the post once it is secured so i think this could work. Where were you able to find that pedestal? Looks like it even has cup holders! haha. You've been making some serious progress.